American financier; born at Zeckendorf, Bavaria, Dec. 8, 1832; died at Grand Rapids, Mich., Feb. 8, 1892. He attended school up to the age of fifteen, and after two years' commercial study he sailed for America. After working as a mercantile clerk in Cincinnati, Ohio, and in other cities, he went (1852) to Grand Rapids, where he became proprietor of a clothing establishment, subsequently opening branch houses in other cities of America. He afterward turned his attention to the lumber trade, and soon owned a large portion of the city. He became connected with several companies, was vice-president of the City National Bank, and a stockholder in many other concerns. He was elected mayor of Grand Rapids in 1872 and reelected in 1874, and from 1871 to 1872 he sat in the state legislature. He was member of the Forty-eighth Congress, representing the Fifth Michigan District. 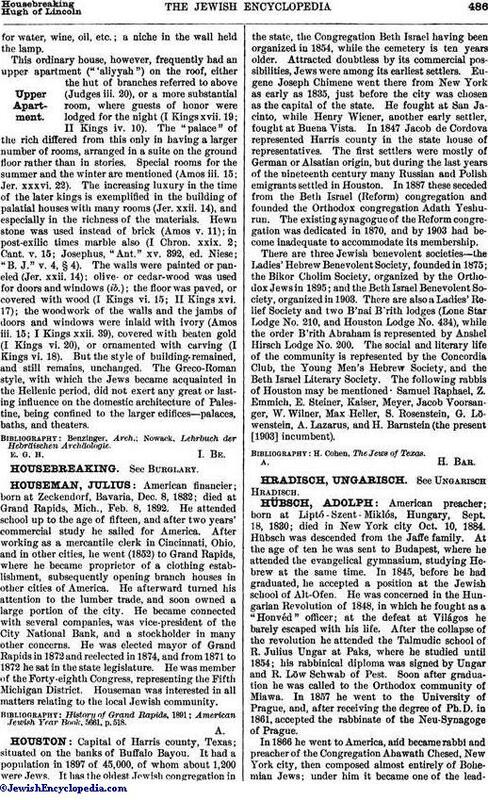 Houseman was interested in all matters relating to the local Jewish community. American Jewish Year Book, 5661, p. 518.